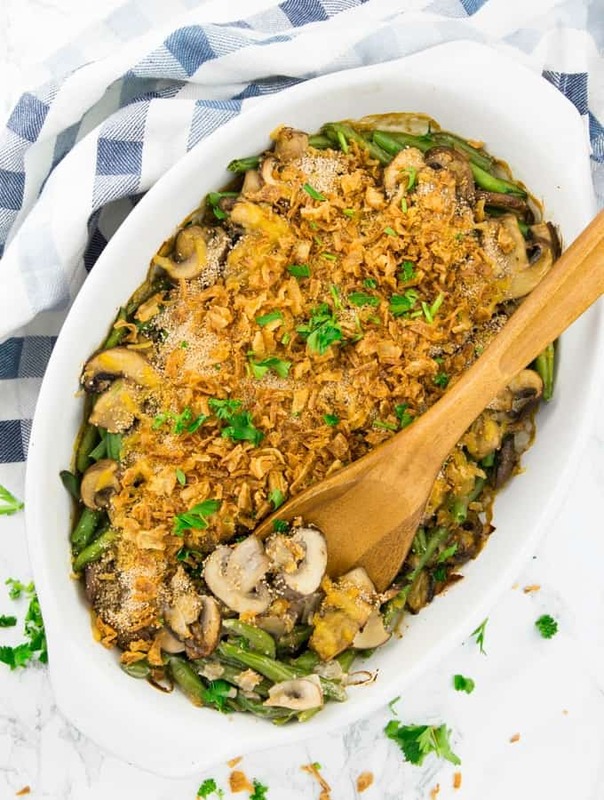 This vegan green bean casserole is a great homemade spin on the iconic Thanksgiving staple that is made with canned beans and soup. It’s creamy, savory, and has crispy fried onions on top. The perfect side dish for the holiday season! 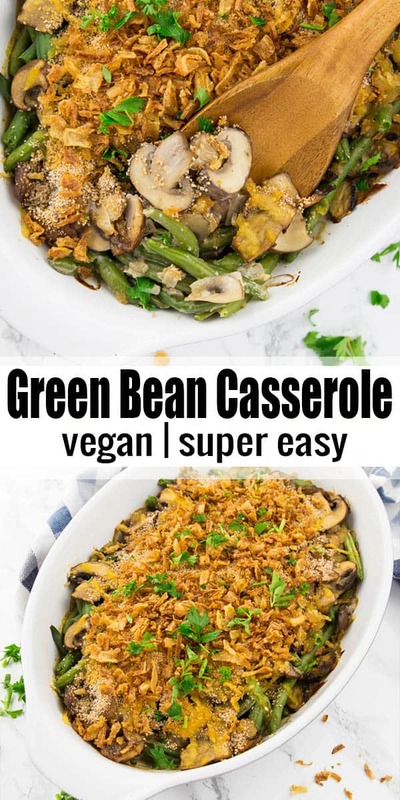 If you used to like green bean casserole and you’re looking for a vegan version, you’re at the right place! My vegan green bean casserole is not only super delicious and comforting but also much healthier than the traditional Thanksgiving dish invented by Campbell’s. STEP 1: Finely chop the onion and slice the mushrooms. STEP 2: Heat some oil in a large pan and sauté the chopped onion for about 2 minutes on high heat. Then add the mushrooms and the garlic and cook them for another 3 minutes. STEP 3: Stir in the soy or oat cream. If you can’t find soy or oat cream, you could also use thick full-fat coconut milk. STEP 4: Combine the corn starch with the water and add it to the mushrooms together with the soy sauce. Season with salt and pepper. STEP 5: Cook the frozen beans for about 5 minutes. Drain and put them in a casserole dish. STEP 6: Pour the mushroom sauce over the green beans. Sprinkle the vegan cheese on top. STEP 7: Combine the bread crumbs with paprika powder and garlic powder. Put it on top of the vegan cheese. Preheat the oven to 350 °F and bake the green been casserole for 20 minutes. STEP 8: Sprinkle with the fried onions and freshly chopped parsley. Serve immediately. I used soy cream for this recipe. You could also use oat cream or rice-based cream instead. In Canada, Australia, and Great Britain it’s easily available in supermarkets, but so far I haven’t seen it in the U.S. You might want to check out your local health store. If you can’t find it, you can replace the soy cream with thick full-fat coconut milk. Or even with a mixture of cashew butter and water. Make sure that the fried onions you buy are vegan. Not all brands are vegan. I know that Trader Joe’s fried onions happen to be vegan. Just check the labels and I’m sure you will be able to find more brands. Or make them from scratch if you’ve got more time. I used cremini mushrooms for this green bean casserole. I don’t suggest replacing them with any other kind of mushrooms. 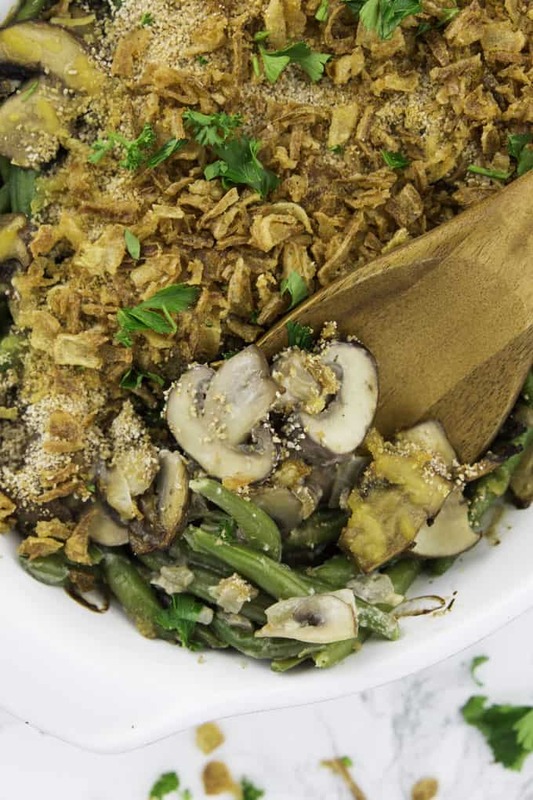 You can prep this vegan green bean casserole ahead of time. Just store the bread crumbs in an airtight container and cover the casserole dish with plastic wrap. Store both in the fridge. When you’re ready to eat, sprinkle the vegan cheese and the bread crumbs on top and bake it for 20 minutes. I think the best part of this green bean casserole is the creamy beans and the crunchy top. This way the green bean casserole will still be crunchy. If you make the entire dish the day before and then reheat it you won’t have the crunchy crust anymore. 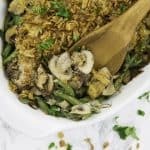 How is this vegan green bean casserole different from traditional green bean casserole? Maybe you’ve asked yourself “is green bean casserole vegan?” Or someone else asked you at a Thanksgiving dinner. No, in general green bean casserole is far from being vegan. The classic green bean casserole, which was created in 1955 by Campbell’s, consists of Campbell’s cream of mushroom soup. This soup contains dairy in the form of cream. Also the rest of the ingredient list doesn’t sound too appetizing to me: three kinds of vegetable oil, modified food starch, monosodium glutamate, soy protein concentrate, yeast extract, and flavoring. Instead of canned mushroom soup, I used a mushroom sauce with fresh onions, soy cream, and soy sauce. If you can’t find soy cream where you live, you could also replace it with thick full-fat coconut milk or cashew butter with water. All of these variations will lead to a creamy and delicious sauce. Vegan green bean casserole – frozen or canned beans? 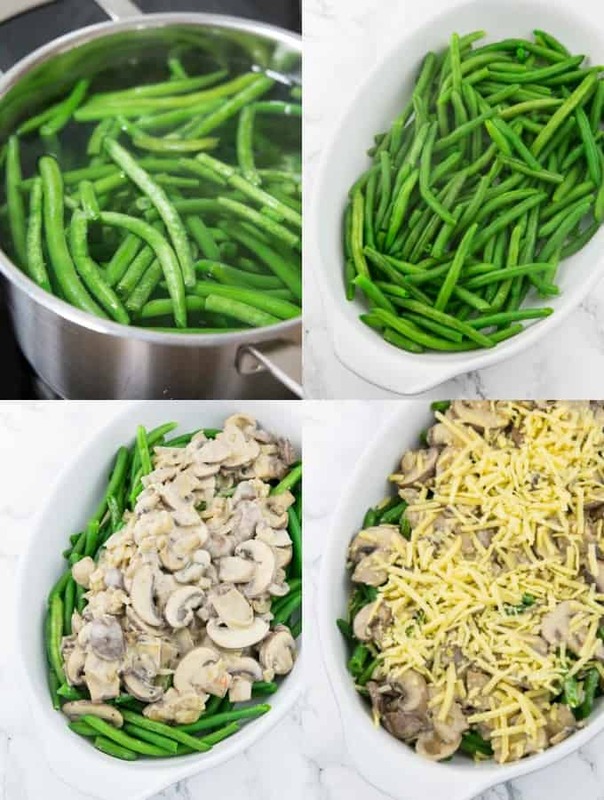 I highly recommend using fresh or frozen beans for this green bean casserole. It’s so much better this way than with canned beans. I know the iconic Thanksgiving staple from the 80s calls for canned beans and soup, but homemade and fresh is always better! Can you make green bean casserole the night before? Yes, you can prep this vegan green bean casserole ahead of time. However, I wouldn’t recommend making the whole dish the night before and then reheating it. Just store the bread crumbs in an airtight container and cover the casserole dish with plastic wrap. Store both in the fridge. When you’re ready to eat, sprinkle the vegan cheese and the bread crumbs on top and bake it for 20 minutes. This way the green bean casserole will still be crunchy. If you make the entire dish the day before and then reheat it you won’t have the crunchy crust anymore. I would not recommend freezing this green bean casserole if you have any leftovers. Unfortunately, the cooked green beans will not freeze well. Neither will the crispy bread crumb topping. How long will green bean casserole last in the fridge? Properly stored in the fridge in an air-tight container, this green bean casserole will last 3-5 days in the fridge. Can you microwave green bean casserole? If you can, you should reheat this green bean casserole in the oven instead of in the microwave. This way, the top will stay crispy. Cover the casserole dish with foil when you reheat it in the oven, so it doesn’t burn. Preheat the oven to 350 °F and bake it for 10-15 minutes. Looking for more vegan Thanksgiving recipes? I hope you like this vegan green bean casserole recipe as much as we do around here. 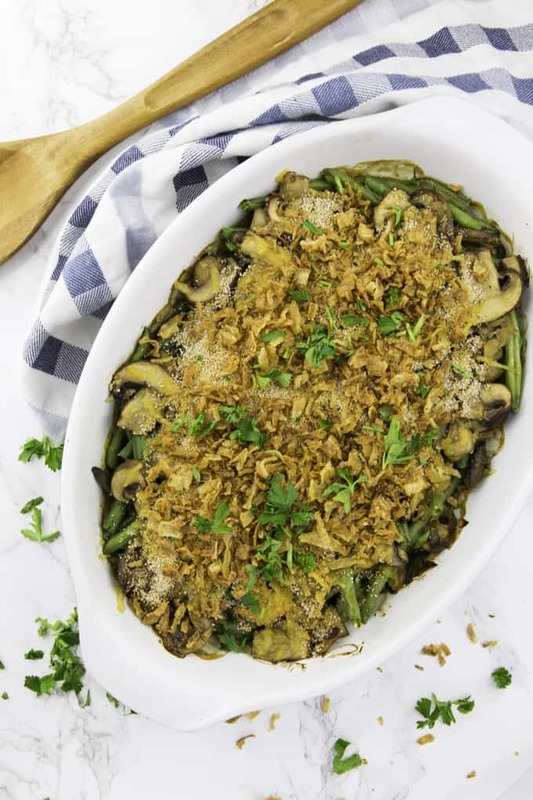 This vegan green bean casserole is a great homemade spin on the iconic Thanksgiving staple that is made with canned beans and soup. It's creamy, savory, and has crispy fried onions on top. The perfect side dish for the holiday season! Finely chop the onion and slice the mushrooms. Heat some oil in a large pan and sauté the chopped onion for about 2 minutes on high heat. Then add the mushrooms and the garlic and cook them for another 3 minutes. Stir in the soy or oat cream. If you can't find soy or oat cream, you could also use thick full-fat coconut milk. 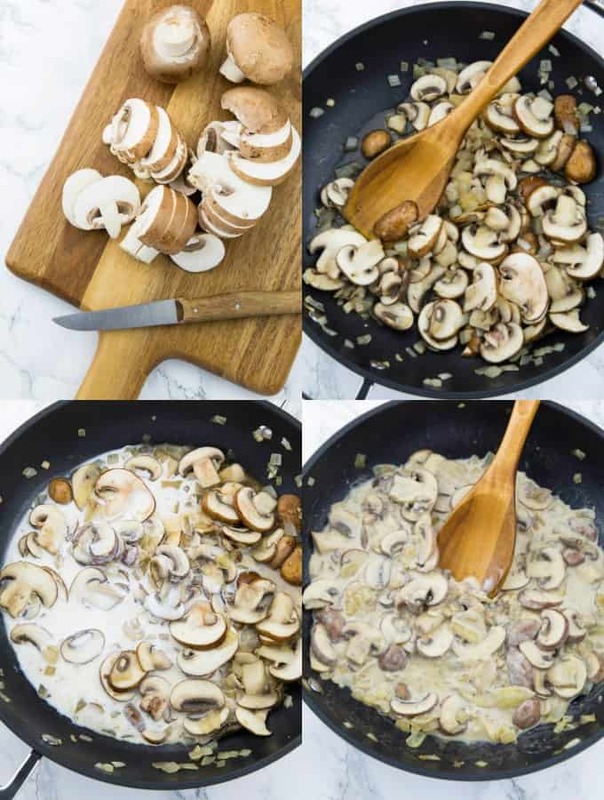 Combine the corn starch with the water and add to the mushrooms together with the soy sauce. Season with salt and pepper. Cook the frozen beans for about 5 minutes. Drain and put them in a casserole dish. Pour the mushroom sauce over the green beans. Sprinkle the vegan cheese on top. Combine the bread crumbs with paprika powder and garlic powder. Put it on top of the vegan cheese. Preheat the oven to 350 °F and bake the green been casserole for 20 minutes. Sprinkle with the fried onions and freshly chopped parsley. Serve immediately. I used soy cream for this recipe. You could also use oat cream or rice-based cream instead. In Canada, Australia, and Great Britain it's easily available in supermarkets, but so far I haven't seen it in the U.S. You might want to check out your local health store. If you can't find it, you can replace the soy cream with thick full-fat coconut milk. Or even with a mixture of cashew butter and water. Make sure that the fried onions you buy are vegan. Not all brands are vegan. I know that Trader Joe's fried onions happen to be vegan. Just check the labels and I'm sure you will be able to find more brands. Or make them from scratch if you've got more time. I used cremini mushrooms for this green bean casserole. I don't suggest replacing them with any other kind of mushrooms. 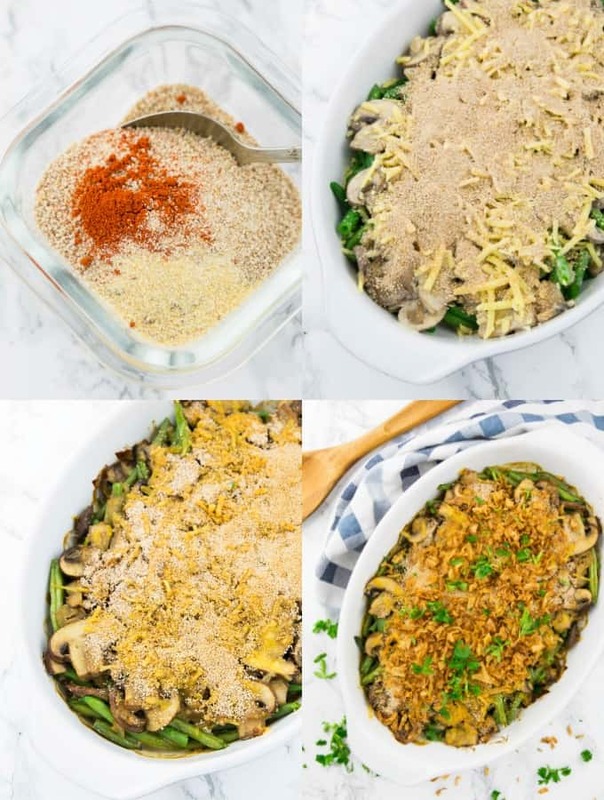 You can prep this vegan green bean casserole ahead of time.Just store the bread crumbs in an airtight container and cover the casserole dish with plastic wrap. Store both in the fridge. When you're ready to eat, sprinkle the vegan cheese and the bread crumbs on top and bake it for 20 minutes. I think the best part of this green bean casserole is the creamy beans and the crunchy top. This way the green bean casserole will still be crunchy. If you make the entire dish the day before and then reheat it you won't have the crunchy crust anymore. 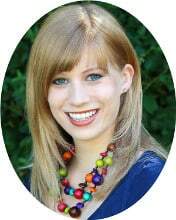 « Vegan Diet – Everything You Need To Know About Becoming Vegan! Tested this vegan green bean casserole for Thanksgiving next week and it was really good! Thanks for the recipe, Sina!